Free and open to the public. Image: Fritz Liedtke ’02, April, 2011. Ruth Lantz MFA ’10 (Visual Studies), Grass is Always Greener, 2012. Samuel Rowlett ’02, Landscape Painting in the Expanded Field, 2012. PNCA presents its first juried alumni exhibition in the Swigert Commons. This exhibition provides a rare opportunity for PNCA and the Portland cultural community to see the scope of contemporary art, craft, and design by alumni from PNCA’s Bachelor of Fine Arts and Masters of Fine Arts programs. It offers the viewer the opportunity to become an institutional archaeologist, to dig down through the accumulated strata of object, image, and idea to get at the cultural DNA of the College. For alumni, it is an appropriate homecoming or completion of a circle. Major exhibition support has been provided by The Ford Family Foundation. There will be an opening reception on Wednesday, September 5 from 6-8pm. The distinguished jurors include Randy Gragg, Editor, Portland Monthly Magazine; Namita Gupta-Wiggers, Curator, Museum of Contemporary Craft; Sarah Miller-Meigs, Founder, lumber room; Deanne Rubinstein, Member, OHSU Art Committee of the Marquam Hill Steering Committee; Stephanie Snyder, John and Anne Hauberg Curator and Director, The Douglas F. Cooley Memorial Art Gallery, Reed College. The exhibition is curated by Victor Maldonado, Assistant Professor/Inclusions Specialist at PNCA. PNCA likes to say it prepares students for a life of creative practice. Trust demonstrates the fruits of that life. Major exhibition support has been provided by The Ford Family Foundation. 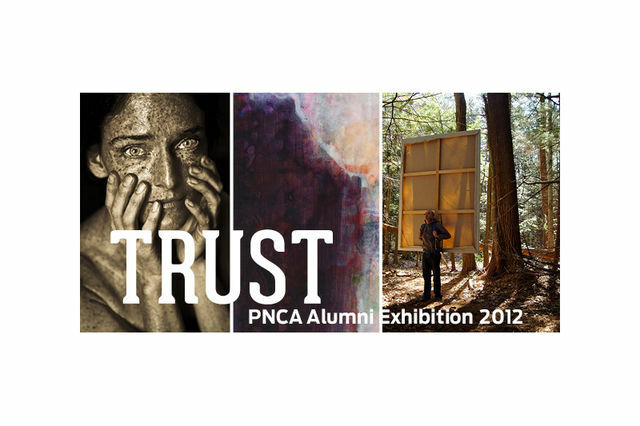 For more information on the exhibition call for entries, http://www.pnca.edu/about/alumni/c/exhibition.